A play. Adapted for the stage by David Wood. From the books by Enid Blyton. 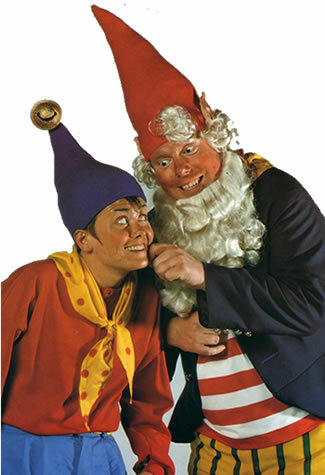 First performed in 1993, NODDY opened at Wimbledon Theatre, followed by a long tour, including a Christmas season in London at the Lyric Theatre, Hammersmith. 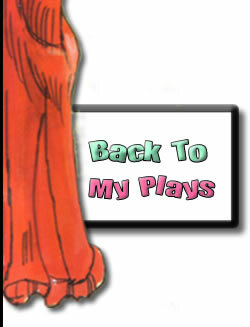 The play was presented by Clarion Productions. Exploiting the excitement of life theatre with imaginative staging, music, light, puppetry and lots of audience participation, the play will be a hit with all, whether they know Noddy or not. The plot may be familiar enough – Noddy and his friends pitted against the sneering goblins and a greedy witch – but the treatment is fresh, funny and inventive. As in the original works, Noddy learns the value of friendship, hard work and honesty, through a series of adventures : building his house in Toytown, driving a car, outwitting his enemies, even surviving a hair-raising experience at Noah’s Ark! 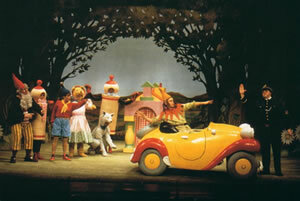 David Wood writes : When I was first offered the opportunity of adapting Noddy, I wasn’t, to be honest, over-enthusiastic. For some years, teachers had protested that certain aspects of the NODDY books were politically incorrect, and librarians had removed the books from their shelves. However, upon investigation, I found that all the books had been adjusted, and that the new television series had created a whole new audience. Noddy was as popular as ever. Indeed, it was a delight to go back to the original books, particularly the early ones, and find a really strong storyline, with meaty characters and situations. 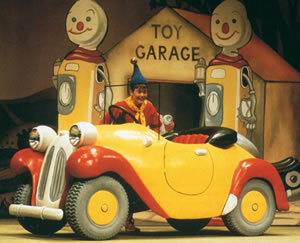 I first began reading NODDY in 1949, when the first book was published. I remember loving the books. Returning to them all those years later made me see why they had worked so well, and still do. Working on the play, and directing the original production was a real pleasure, and Clarion Productions didn’t skimp on the physical production. Susie Caulcutt’s set and costumes, based on the original illustrations, looked beautiful and worked a treat. For the published text of the play I wrote an introduction, which maybe of interest : “Enid Blyton may go down in history as the person who taught more children to read than anyone else. Or, to be exact, to enjoy reading. Most of us can remember the moment of excitement when, having struggled over the hurdles of learning the shapes of letters and the sounds they make, we were able to make the transition to reading a book by ourselves for the first time – for pleasure. And for so many of us, that book was written by Enid Blyton. I shall never forget the day my mother first took me to buy a book of my own choice. It turned out to be a FIVES book, and that afternoon I read it in one sitting. Enid Blyton made me want to turn the page, to discover what happened next. Her storytelling still made sure I didn’t want to put that book down until I had finished it. For my generation, Enid Blyton was also the Blue Peter in our lives. Through her magazines and clubs, she made us aware of charitable causes and encouraged us to do things to help. I was a Busy Bee, and still have the certificate thanking me and my friends for putting on a puppet show in aid of the PDSA. That puppet show led to my interest in theatre and my subsequent career, so perhaps I have even more to thank Enid Blyton for! The world of theatre is closely allied to the world of books. Whereas Enid Blyton’s mission was primarily to encourage children to read, I have tried, since 1967, to trigger and expand children’s imaginations through theatre. For me, and those who work with me, the child’s first visit to the theatre is the most important day of his or her life! We must not disappoint, bore, or patronise our audience; we must amuse them, excite them, make them think and feel. Furthermore, we must tell them a story, which, using theatrical techniques such as scenery, costume, light, sound, music, mime or puppetry, engages children and makes them eager to, as it were, turn the page. I read all twenty-four NODDY books, many for the first time. I was five when the first book was published, and remember owning a copy, but long after I “grew out of” NODDY, Enid Blyton was adding more stories to the list! In attempting to be faithful to Enid Blyton’s original creation, I tried to identify the elements of the books that really appeal to children. 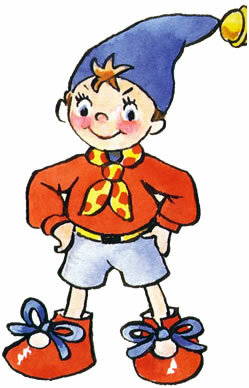 First of all, NODDY may be a wooden doll, but he is really a child in a world of adults (Big-Ears, Mr. Plod, Mr. Noah, etc.). He is a child learning how the world works, how to cope, how some people are your friends and others cannot be taken at face value; in the books, the themes of fairness/unfairness, generosity, meanness, loyalty and the encouragement of independence are rife; also, as in much of Enid Blyton’s work, the theme of justice is very important. NODDY may be a “child”, but once he is accepted in Toytown he soon acquires a house of his own, a car of his own, and a job (taxi driver) of his own. For children, these are the external signs of growing up to which they (all too soon) aspire. Children love making “dens” or sitting in Wendy houses, driving pedal cars or riding bikes and playing pretend games in which they are policemen, teachers, bus drivers or Mothers and Fathers; NODDY fulfils all these dreams for real, albeit in a fantasy world. And that fantasy world is, of course, another reason for the success of the books – a world peopled by toys, all of them alive and living in a colourful town. Toy engines arriving at a toy station, teddy bears mingling with wobbly men and skittles in the Square, toy cars buying petrol from a toy garage, a Noah’s Ark full of real live toy animals, bouncy cuddly toys going about their daily business just like people (mainly adult people) in our “real” world. Another appealing factor of the books is another world, an enchanted magic world, of friendly brownies and unfriendly goblins lurking in the Dark Wood. Characters from the realms of traditional fairytales and the supernatural prove an imaginative source of excitement and fascination for children. So these elements, all of which are truly theatrical, needed to be moulded in to the shape of a play, with one through storyline, emotionally involving the young audience, encouraging them to participate, and giving them a very special experience – for many of them their first ever experience of live theatre. The original production employed a cast of eight actors, some of them doubling. A larger cast is possible. The play and piano/vocal score are published by Samuel French Ltd. First Class Professional, Repertory & Foreign Rights : Casarotto Ramsay Ltd. UK Amateur Rights : Samuel French Ltd. Optional incidental music, composed by Peter Pontzen for the original production is available from Samuel French Ltd.